18 months ago, George W. Bush landed on the USS Abraham Lincoln and delivered a victory speech before a banner that proclaimed "mission accomplished." Since then, more than 900 American soldiers have died in the chaos of Iraq, with no end in sight. If you think that is evidence of failure, you aren't paying attention. In fact, Bush could have proclaimed victory in the war he really cares about the moment the first bomb dropped on Baghdad. If you start from the naïve assumption that the Bush Administration means what it says, you perforce reach the conclusion that the invasion of Iraq has been a failure, and that the goals of its anti-terror policies hover near a horizon too hazy to make out whether we are gaining or losing ground. But this view is based upon false assumptions. We are in fact exactly where George Bush wants us to be: endless war. If you reverse-engineer administration policy from the consequences of its actions, this conclusion is inescapable. What are the results of being quicksanded in Iraq? Young Americans come home in boxes, of course, but we know that Bush has never lost sleep sending others to their deaths. Seemingly unnoticed is the remarkable coincidence that the other effects created by this administration's policies are all manna to its masters. High oil prices fatten Saudi royals and American oil barons alike. The endless cycle of bombing and rebuilding in Iraq is a windfall of unprecedented scale to companies like Halliburton, who deliver munitions and reconstruction projects in equal measure. Our "war president" has turned national sacrifice on its head, and enriched the "ownership class" while those with the least stake in the system do the heavy lifting. The endless war cows citizens and a toothless press into blind obedience. The mantra of fear turns society into an atavistic herd blindly following cynics. Bush's confabulation of Saddam for Osama is not evidence of meaningful confusion: "the enemy" is a fungible prop, and in endless supply. If Saddam Hussein had not existed, the Bush cabal would have invented him; in a very real sense, they in fact did just that. From Iraq's war with Iran, to helping him obtain the very weapons of mass destruction we accused him of (still) having, to voting in favor of his misadventure in Kuwait (via Ambassador April Glaspie) before Norman Schwarzkopf voted against it, to the wholesale fabrication of his post-9/11 threat to the United States, Saddam has been a reliable American construct for decades, playing ally or villain as needed. Bush went after Saddam not out of confusion or error, but because he knew Osama, though useful, was too short a tail to fully wag the dog. Thus framed, the recent devastating report from Knight-Ridder exposing the complete absence of planning for post-invasion Iraq is evidence not of Bush's inability to handle "catastrophic success," but of its irrelevance to him. What matters is that we're there, and every branch on the resulting decision tree suits him fine. Successful nation-building encourages the next crusade; a quagmire renews ad infinitum the purchase of his war rhetoric. Remember that after George H.W. Bush defeated Iraq in 1991, he looked invincible at home - until the image of the conquering hero faded a year later, and he lost to Bill Clinton. The lesson George W. Bush learned from his father's experience is now obvious: the mistake was not in ending Operation Desert Storm too soon: it was in letting the war end at all. Contrary to widespread belief, this Administration has learned the lessons of history well. The problem is that they read Orwell's 1984 not as a cautionary tale, but as a "Dynasty for Dummies" handbook, a late addendum to Machiavelli's The Prince. From Bush's perspective, Iraq has been a total success, as has the cat and mouse with Osama. He had no plan to "win the peace" because he has no intention of winning it - winning implies that the war is over, and peace is the one unacceptable outcome. And so this is the America of George Bush: perpetual war; a place where dissent is actionable, the press has been emasculated, government is completely unaccountable, and the executive branch operates at home and abroad largely without checks and balances. George W. Bush has arguably become the most powerful president since Lincoln, whose opponents left Congress entirely, and whose war was not of his choosing. 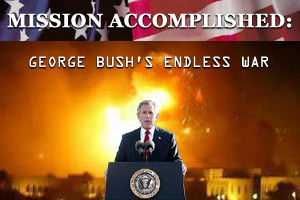 If you aren't troubled by the body count, Bush's success looks pretty spectacular indeed. The gravity of the 2004 presidential election, then, boils down to this: George W. Bush did not pursue a conservative agenda and fail. He is dangerous, beyond all expectation, because he has pursued a radical agenda and succeeded.